Samori Marksman, program director of WBAI in New York, died on March 23, 1999 at the age of 51 of heart failure. Samori began working as a producer of programs on international affairs at WBAI in 1977 and continued this position on the daily program "Behind The News." 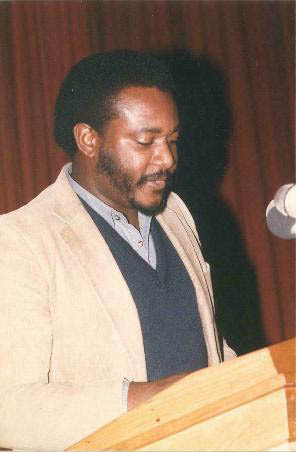 From 1979 to 1983 he worked as a researcher and publicist for the government of Grenada. He taught journalism part time at Long Island University. Samori also taught African history and social science at the College of West Africa for four years. Concurrently, he was the Director of the African division of the New York based Pan-African Skills Project, a privately funded agency that recruited individuals trained in science and technology to teach in Africa. He regularly contributed articles on international news to "Covert Action Quarterly," "Caribbean Perspective," and the "Amsterdam News." On the day of his death, WBAI aired a three hour tribute on the afternoon program "Talkback." Many producers, staff members, friends, and listeners paid their respects in one of the most moving programs ever to air on our station. We have encoded the program so that people on the Internet can also hear it. By clicking on , you will download the show to your computer where it will be saved and you can listen to it anytime without being connected to the Internet. By clicking on you will listen to the show over the Internet, without actually saving it to your computer. You may experience some lag or gaps in the audio if there is net congestion. This is the quickest way to hear the show, since downloading it may take up to an hour, depending on your connection speed.